Let’s pause to soak in this scene. I can almost hear the sound of Hawaii’s beloved tradewinds rustling the feathery palm leaves. Can you? 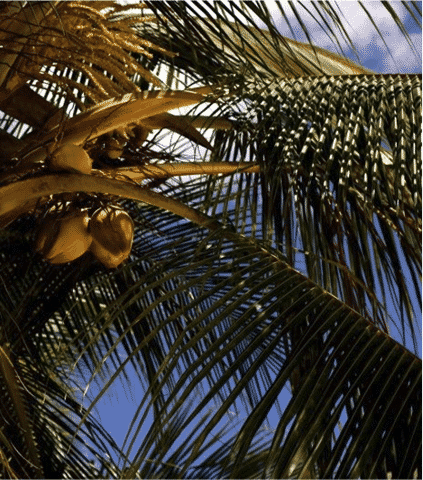 Don’t you also feel more relaxed just looking at bits of blue sky filtered through the palm fronds? I sure do! Mahalo to Sean Fischer-Photography from Minnesota who shared this beautiful Aloha Friday Photo via our facebook community. Very nice photo. I just thought I would add a little about how the Hawaiians used the palm. The cut out the trunk to make a very large drum called a pa’u. It was only used in very specific ceremonies and now days they use it for special Halaus or hula troops. It has a beautiful deep tone and makes your hair stand on end when you hear it. The top of the drum is made from shark skin and you need to hit the drum with a one way stroke. If you hit it going against the skin it will cut your fingers. Thank you , Karen, for that additional insight — it’s very interesting!